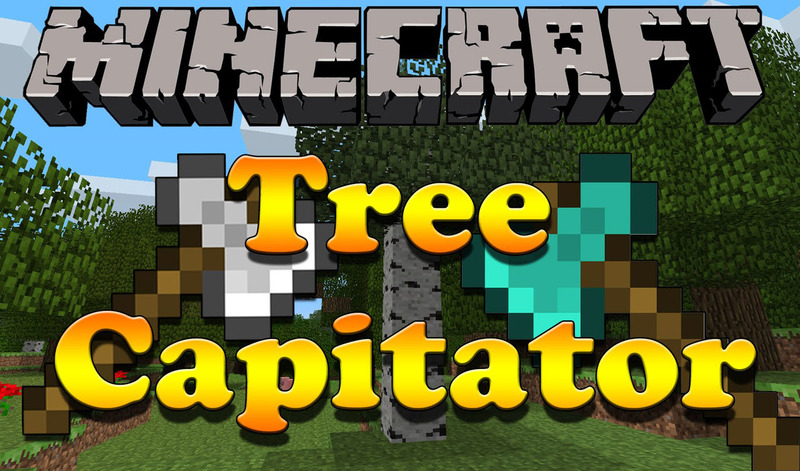 TreeCapitator Mod 1.12.2/1.11.2 adds one simple element to the game: axes cut down all wood touching the wood block you cut down. So, the next time you see one of those twenty block high monstrosities, you won’t think of how much work it’ll be, you’ll think of how much wood you’ll get. You can also mess around with the config file to change things like what’s considered a tree, how many leaves the trees need to be considered a tree, what an ax is, and whether or not you need an ax. So, with mods that add axes into minecraft like IndustrialCraft 2, or mods that add in trees like Forestry, you can make sure that you’ll be able to use all of your ax items, and cut down all of your trees. 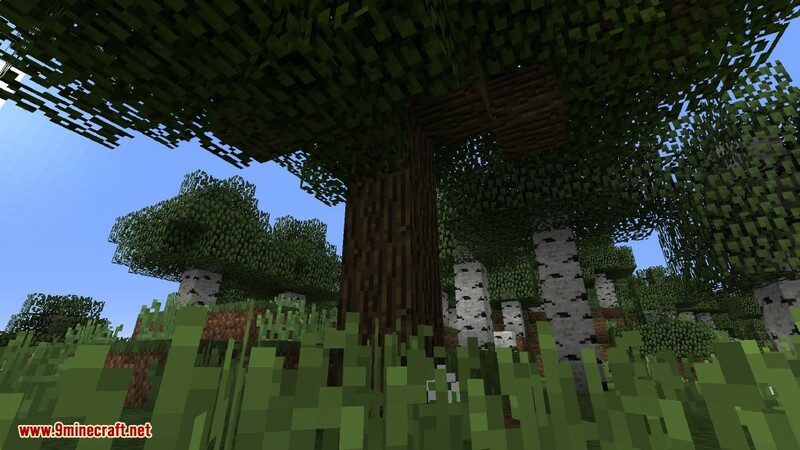 This mod is a great addition to Minecraft to significantly speed up the removal of trees in the game. It works simply by using an axe to destroy the bottom block of any tree. As soon as you do the entire tree explodes into all its individual blocks. 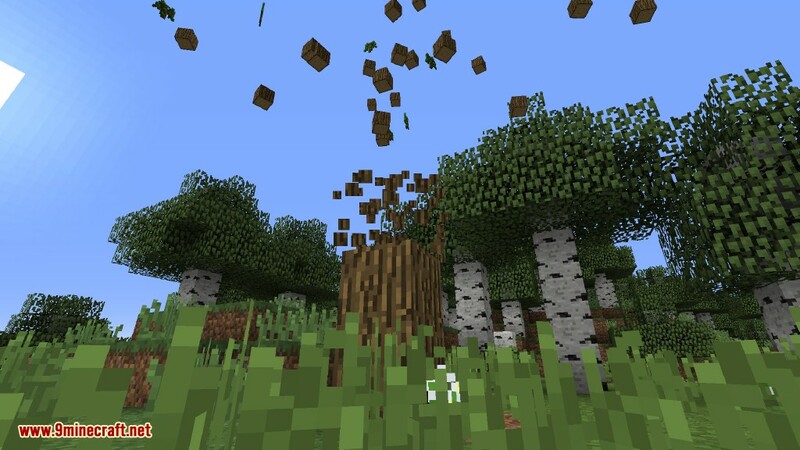 What’s great is that it also destroys the remaining leaf blocks and gives you all the saplings that would have dropped. Probably the most useful of this mod would be taking down Jungle trees. They are already so massive that destroying them just takes so much time. Well now with this mod you can take a whole one down in seconds. It’s actually not much of a “cheating” mod as it’s more of a time-saving mod. You will still take the same damage to your tools as you would normally and the time to chop will depend on what level axe you have. And likewise you will probably lose your shears in one tree if you use it on a jungle tree. Depending on the size of the tree will also determine how long it takes to remove that block of wood. Some will take longer than others. You can adjust a lot of these settings in the mod config menu from the main menu of the game. Sneak while chopping to break logs normally (configurable). Configurable list of tool IDs to determine what an “axe” is. Optional item damage based on number of logs broken (defaults to enabled). Optional increasing item damage per block broken (off by default). Option to destroy leaves (enabled by default). Option to shear leaves (with a shear-type item in hotbar). Option to shear vines (with a shear-type item in hotbar). At the drop of a hat. Or rather, the chop of a block!